To celebrate Hanukkah, Iranian-Jewish-American food blogger Tannaz Sassooni, founder of the food blog All Kinds of Yum, dives into the deliciousness that is fried food, and what it means to make your own traditions. 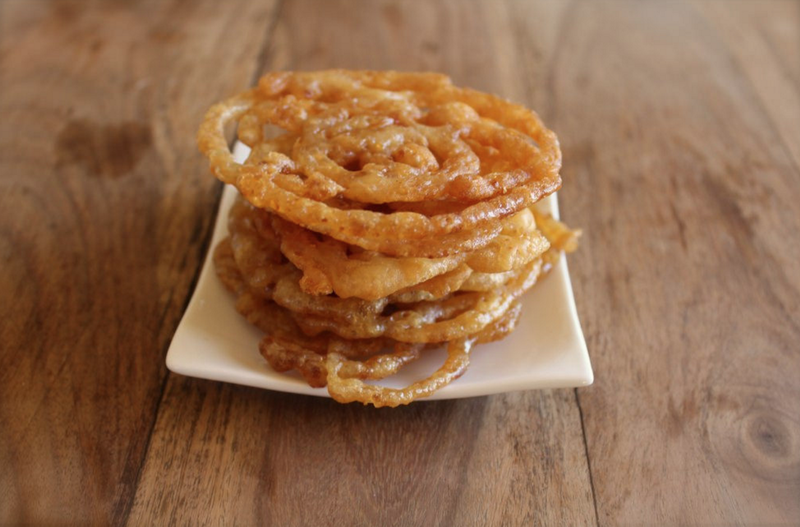 Hers is a light and crispy funnel cake known as zoulbia, an Iranian confection Tannaz’s mother used to make for her when she was a kid. From our friends at Mash-Up Americans. Hanukkah is a wonderful holiday because it’s celebrated by eating fried foods. In ancient times, a tiny bit of oil kept a flame lit for a full eight days, and we commemorate this miraculous light with all manner of oil-fried deliciousness. We all know about latkes, and perhaps sufganiyot, Israel’s jelly-filled Hanukkah doughnuts, but a lot of countries in the Middle East and Mediterranean have their own traditions of eating sweet fried dough things (dreamiest phrase ever) for the Festival of Lights. From Italian fritelle di chanuka—diamond-shaped fritters flavored with anise seeds and raisins — to Moroccan sfenj, orange doughnut rings, the Sephardic world gets creative when it comes to going fried. The Spanish Hanukkah fritters, bimuelos, are sprinkled with cinnamon and sugar; Greek Jews eat loukoumades, fried puffs with an olive-oil based dough; and in Egypt, the fritter of choice is zalabia, purchased from street vendors and eaten hot out of one’s hand. But in our delightfully mash-up world, there’s no reason to limit yourself to the fried dough traditions of a specific region. Why not grace your Hanukkah spread with Italian zeppole, French Quarter beignets, Indian jalebi, Filipino (or Portuguese!) malasadas, Native American frybread, Mexican churros, or Homer’s favorite — good ol’ American doughnuts? Any of those could just as well fit the bill. For my part, I look to my native Iran for my Hanukkah sweet of choice. We don’t have a strong Hanukkah food tradition, but we have a fine oil-fried contender: zoulbia. 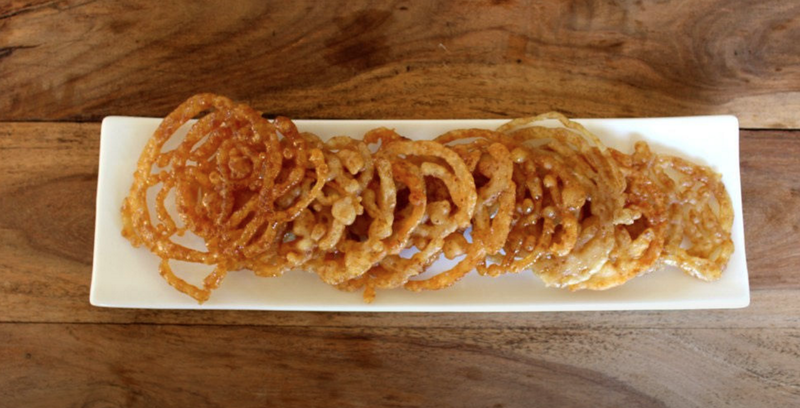 Imagine a light and lacy funnel cake, fried until it’s crisp. When you bite into it, you experience a burst of honey syrup flavored with cardamom and rosewater. I can’t recall the first time I had zoulbia, but I do remember the empty, cleaned-out shampoo bottle my mom used for squeezing squiggles of batter into sizzling oil. I’ve started making my mom’s recipe for zoulbia for Hanukkah every year. It’s a totally made-up tradition, but it feels — and tastes — so right. The following recipe first appeared in All Kinds of Yum. This is a yeast-based batter, so allow time for it to rise. You can buy plastic squeeze bottles from restaurant supply stores, or even from stores like Target, but in a pinch, an empty mustard bottle with a narrow opening, thoroughly cleaned, works fine. Leave out the yogurt for a non-dairy version of this dessert. The batter is very tangy from the combination of yogurt and baking powder, the latter of which also imparts a distinct saltiness. The sweetness of the syrup balances this all out. Mix together batter ingredients, eliminating any lumps of yogurt. Let sit for 1 hour. Make syrup by combining first four ingredients in a small saucepan over medium heat, stirring occasionally, until sugar is completely dissolved. Remove from heat and stir in rosewater. Fill a large pan with a one-inch layer of oil. Heat over medium-high heat until a drop of water tossed into the oil sizzles. Fill squeeze bottle with batter. Squeeze out batter into hot oil, creating spirals and free-form designs, but maintaining a generally circular shape. The end result should be lacy and not too heavy—try to squeeze out enough batter to maintain the zoulbia’s structure, but not too much to formmake a solid mass. Fry for a few minutes, flipping or submerging to fry both sides, until deep golden brown. Using tongs or two forks, carefully remove zoulbia from pan and shake off excess oil. Lower gently into syrup, quickly submerge and remove. Repeat with remaining batter, adding oil as necessary. Cool in a single layer. Enjoy! This post was originally published in The Mash-Up Americans, a place to explore the hybrid culture and hilarious stories from the frontlines of a multicultural, mixed-up, religiously varied, richly rooted life in America. Our mission is to help you—and us—navigate the complexities of a multidimensional life in modern America. Check out their Twitter and iTunes.